I have tasted Wild and Game award-winning products before. Read my Christmas pâté review here http://www.mostlyfood.co.uk/index.php/wild-and-game-for-christmas/ I was expecting quality and tradition and perhaps a bit of innovation. I wasn’t disappointed. The culinary term ‘game’ usually describes meat from animals and birds such as grouse, pheasant, and partridge, and Wild and Game add other ingredients and seasonings to those free-range birds to create a selection of products to tempt all lovers of good food …unless they are vegetarian, of course! Wild and Game’s range of pies and pasties combine pheasant meat with pork, beef or chicken. 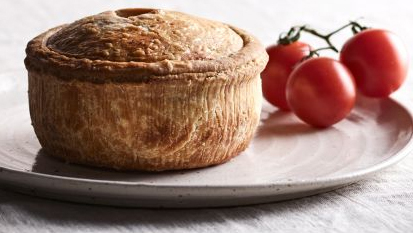 I have tried the pork and game pie and it truly was a stunner. The traditional crust was golden and well-textured, but the filling was the star of this epicurean centrepiece. Pork and pheasant fill this pie to the brim. No gap from crust to crust, from up to down or side to side. The meat is well-seasoned and substantial. This would be a perfect pie for a picnic or a summer al fresco lunch. Yes, there are many other pies out there and many are cheaper, but cost and value are not always the same thing. Wild and Game pies are worth every penny. One will be convinced after the first bite. There is a warning on the Wild and Game site which states: MAY CONTAIN LEAD OR STEEL SHOT. Oh, deep joy! That says that the game within the pastry case truly has had a life on unobstructed wing, swooping over heather, sun on its feathery back. OK, a bit poetic but you get the gastronomic picture. Wild and Game present an opportunity to try game, perhaps for the first time. Their goods are delicious and rather smart. One can enjoy these flavourful meats all year long to add a little luxury to dinner parties or even a casual snack with friends.